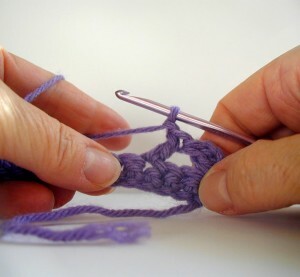 The V-stitch is a very simple stitch that can be used to add a decorative look to your crocheting. You can use it with double crochet to add variety to your crocheting patterns. 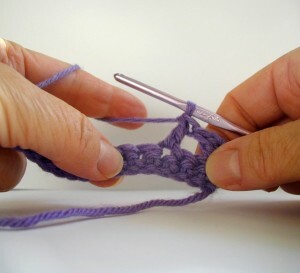 If you know how to double crochet and single crochet, it will be very easy to do. Follow the instructions below. Start with a row of single or double crochet. In this tutorial, I used 15 sc. First, double crochet in the stitch. Finally, double crochet in the same stitch. Skip 2 stitches and make a v-stitch in the next stitch. This entry was posted on Tuesday, February 22nd, 2011 at 11:42 AM by Robin Beers	and is filed under Tutorials and Help. You can follow any responses to this entry through the RSS 2.0 feed. You can leave a response, or trackback from your own site. Wow! I like this v-stitch. I’m going to try it one day. This makes quick and easy baby blankets. I love the v-stitch! Start your first v-stitch row with a chain 3, then double crochet in the next sc. 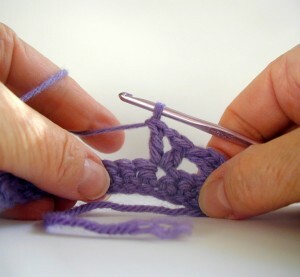 This will be your first part of your first v-stitch. Following the v-stitch directions above, continue across. You should have 10 v-stitches. When you finish the last v-stitch, you should then have 1 stitch left so just double crochet in that stitch and end the row. 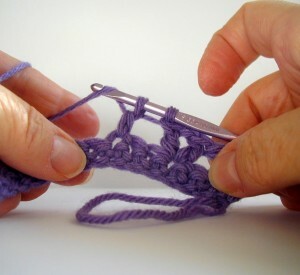 Turn and repeat with the first chain 3 and make 10 v-stitches across again. And remember, when you are on the second row of v-stitch, you make the v-stitches in the ch-1 spaces of the previous row’s v-stitches! Hope this helps! This stitch can be incorporated into so many designs. I really like this. I bought a book with a pattern for a cardigan and it requires v stitches but doesn’t show how to do them. My book wants them to be single crochet v stitches and have a multiple of 3 plus 2…I’ve searched and searched by I can’t seem to find anyone who can help me understand what this means. I’ve tried to figure it out by trial and error but I’ve hit a wall. Please help explain? It is really odd that the pattern doesn’t tell you how to make the stitch. My guess is that it wants you to sc, ch 1, sc all in one stitch. 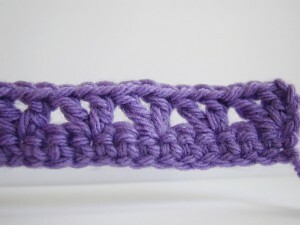 Sort of like the V stitch shown in this tutorial but with single crochet stitches instead. Try looking over the pattern again. Sometimes the instructions for special stitches are hidden and can be tricky to find. It may be at the beginning before the pattern, or even written within the pattern.